For those of you who want to get rid of the hassles of using a manual cutter, here is the best alternative! ATC12 tubing cutter is an automatic cutter which does not require any manual arrangements. It is simpler and safer to use as well as more efficient and comfortable. General Pipe Cleaners ATC12 is among the bestsellers and is highly suitable for tight spaces. Its dimensions and weight are as follows; 7 x 4.8 x 1 inches and 0.8ounces. 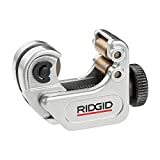 Due to its small size and compact design, it is extremely helpful when a pipe is needed to be cut while plumbing, but there is no room for using large sized tube cutters. The unique specification of ATC12 tubing cutter is that it does not have any manual operations. You don’t need to turn any knobs, all you need to do is place it around the pipe and close the gates; they will tighten up automatically and as the cutter wheels are spring loaded therefore it would slice off the pipe itself without any manual efforts! It is exclusively made to cut copper pipes and has a capacity to cut pipes with a ½ inches diameter. No doubt ATC12 tubing cutter is an incredible tool. However, its pros and cons need to be weighed carefully before purchasing. The most valuable feature it has is the Auto Cut feature through which the tubes can be cut instantly, taking significantly less time than the traditional tube cutters. The benefit prevailing from this is that the user does not need to rotate the knob manually anymore. 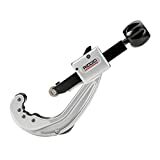 In addition to this ATC12 tubing cutter has a comfortable design, it is easy to use and carry, and its sharp blades can cut the copper tubes with one-inch clearance. However, users have observed that the cuts are not always clean and changing the blades is a hassle. Also, some consumers had experienced ATC12 tubing cutter having poor quality. The primary reason to buy this tube cutter is that it is automated and requires minimal human effort. As the tube cutter has a loaded spring wheel cutter, it exerts the right amount of pressure to cut the pipes, and it ensures user safety as well. Moreover, the usage of other tube cutters is limited because of their extended structures and large sizes. Therefore, ATC12 tubing cutter is the best choice as it has no such limitations and can be used in normal circumstances as well as for stub-out work and in narrow spaces. 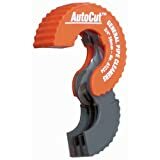 ATC12 tubing cutter is unique yet a very useful product. It is highly beneficial for professional users and would bring perfection and neatness in their work. Alongside, its accurate and quick cutting would lead to more satisfaction and the price charged is reasonable too. TEKTON 6460 Tubing Cutter 1/8-Inch to 1-1/8-Inch O.D.